Here is a translation of a Tamil anugraha bhaashanam (benedictory discourse) by the Sringeri Acharya, Sri Sri Bharati Tirtha Mahaswamiji given at Madurai during May 2012 (The pdf is here, if you want better readability – “The way to become free from death“). The residents of Madurai have organised the Guru vandana today; this has pleased me much and therefore I convey my blessings to you all in that regard. Certain requests of me were placed here. Among them, the first one was that Acāryāl should visit Madurai every year. (Smiling) I thought that there would be another kind of request placed of me – that I should visit Madurai every month (sarcastically smiling). Well, no one has conveyed such a request. 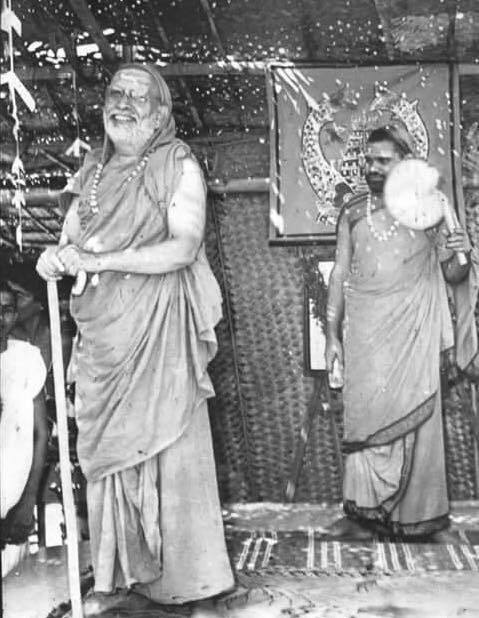 In any case, it is quite clear that you all have a deep devotion and śraddhā towards the Sringeri Pīṭham and the Sringeri Jagadguru. This gladdens me much. A lot of people here in this gathering know whether I can come to Madurai every year or not, so I am not elaborating on it. Another request was placed here. In these days everyone, especially the youth, are extremely worried about death; therefore it was asked that I should say something about how to get rid of that worry and fear of death. The purport of the śloka is – just because you are afraid of Yama (death) doesn’t mean that Yama will leave you alone. In this world, if there is someone who is afraid of us, then we can choose to not disturb that person or of a feeling of pity for them. But for Yama, such a feeling of pity does not arise at all. “This person is afraid of me, therefore I should not disturb him”, such a thought does not arise for Yama. Whoever it may be, whatever position one may be in, whether one is afraid or not afraid, when one’s lifetime is over he will frisk one away from here. The śloka says – mṛtyoḥ bibheṣi kiṁ mūḍhāḥ bhītaṁ muñcati kiṁ yamaḥ – “Oh fool! You fear death, but what is the point? Do you think because of that you will escape its jaws? Just because you fear him, Yama will not leave you “. However, Yama does not bother a particular kind of person. Who is such a person? – That person who is not born, who does not have the experience called birth. ajātaṁ naiva gṛhṇāti – “he does not bother that one who is not born “. Therefore – kuru yatnam ajanmani – if you want to be free of Yama make yourself free from birth – this is the message. There is no other way to escape the jaws of death except by making oneself free of birth. Thus one should strive to be free of birth. What is the way for this? Ātmajñāna is the only way for that. For one who has gained ātmajñāna, there is no further birth again. Such a person does not have to go through birth again. Thus one should strive to attain ātmajñāna. We may think that we all possess ātmajñāna. After all don’t we know ourselves? Everyone has the knowledge “I am so and so, I am this person’s child, I was born in that year, such is my age, such is my profession, so much is my weight and height and so on. I have so much knowledge about myself, what other thing is there to know about me? Where is the question of some other ātmajñāna? “ . Well, to this the Śāstrās say, whatever description you have given such as the above, all such descriptions belong to the body alone, not to the Ātmā. Birth, age, color, weight, height, etc., all belong to the body and not to the Ātmā”. Though the Śāstrās say so, we are not able to discern the difference between the two, the body and Ātmā. Because of this ignorance about the difference between the two, whatever properties are there for the body all those we associate with the Ātmā. The Śāstrās say very clearly that these two are different. They teach us that we should have a strong conviction in the fact -“The Ātmā is changeless and ever-existing. I am that Ātmā”. However, we don’t have such a strong conviction. This is because for so many births, for so many janmas we have held the belief, “I am the body “. There is something called saṁskāra which every individual has. What does the word “saṁskāra“ mean? When we perform an activity repeatedly, or see (experience) something repeatedly, it imprints on our mind deeply and we continue to have thoughts about it all the time. These impressions are called saṁskārās. Suppose a person has seen an elephant many times, then he continues to have thoughts about the elephant in his mind always. This person therefore has elephant-saṁskāra. Similarly, because we have continued to believe that this body itself is who we are in reality, such a saṁskāra has become very strong in us. Even today, if someone asks us who we are, we continue to give a description of the body. Bhagavatpādā had said that we should first leave this belief that this body is who we are. He has said – नाहम् देहो नेन्द्रियान्यन्तरंगः nāham deho nendriyānyantaraṁgaḥ – “this body is not me, all changes and properties pertain to the body alone and not to me. I am the nitya-śuddha-buddha-mukta Ātmā”- such a conviction we should have. Bhagavatpādā had conveyed the message of Vedāntā thus. But however much we say, such a conviction does not come easily. If we talk about Vedāntā, most people do not understand what is being said. Moreover they also get sleep. One person said, “I had studied lot of Vedāntic scriptures and comprehended their purport as well. Once I went to a well off person and asked him if I could teach him some Vedāntā. He agreed and asked me to come and teach him Vedāntā. I asked him, ’For how much time should I lecture?’. He said “Please lecture until I have gone to sleep ‘.” Well, many people are like this, using Vedāntā as a tool to get sleep. Why is this the case? It is because our minds are not pure enough. Our mind is not in a state at which it is congenial to the understanding of Vedāntā. Thus if anyone speaks about Vedāntā, we only get sleep, there is no understanding which seems to happen. This is why the Śāstrā says that our minds must first be purified in order that we may understand Vedāntā. When the mind is purified it gets certain qualification to study and understand the purport of Vedāntā. Now thus there is the question of purification of the mind. What is meant by this? If the mind is like a vessel which can be touched, held in our hands, then we can purify it. But the mind is not any such vessel. Well, the Śāstrā doesn’t speak of purification of the mind like any such vessel. The minds has got certain faults (doṣās). If such faults go away from the mind, we say that the mind had become pure. These faults include – desire, anger, jealousy, arrogance, and the like. All these are faults in the mind. As long as such faults are present in the mind, Vedāntā will not appeal, nor can its message can be comprehended. This is because even as the Acāryā is teaching the Vedāntic scriptures, a fellow who has these defects in his mind will be anxious and thinking about all his worldly issues arising on account of these faults though he may be sitting right in front of the Acāryā. “Oh, I had given him so much money, he had given back only so much and more is to come yet. Share prices have been increasing, etc., etc. “, such thoughts alone plague the mind, and not an iota of what the Acāryā is teaching enters the mind. That is why even among our audience if we were to ask people what they got from the Acāryā’s talk, they reply “Acāryā knows Tamil very well” (laughing). This alone people seem to understand. Such a state is there wherein the mind is elsewhere during the discourse, dwelling upon worldly thoughts. It is so because our minds are not yet free of desire. Despite enjoying so many things, despite experiencing several pleasures, our minds are not satisfied and continue to hanker for more. As long as we continue to hanker for more worldly achievements and pleasures, as long as we remain unsatisfied with whatever we have, we can never understand Vedāntā. The presence of worldly desires is thus impurity in the mind. This is to be removed from the mind. Hanumān had clearly mentioned the state of an angry person. A person who is angry may do any pāpa or adharma whatsoever. He may do anything and say anything without considering dharma and adharma. He may even abuse a person who is worthy of our greatest respect – kruddho hanyāt gurūnapi. Thus we understand from Hanumān statements that anger is very harmful to us. After becoming sorrowful about his actions like this, Hanumān goes to the Aśoka forest to check for Sītādevī. Finding Sītādevī unharmed there, he finally became peaceful. The message here for us is that anger brings misery to us. Ahaṁkārā (pride/arrogance) is also a similar destructive trait that we have. Because of ahaṁkārā a person thinks that he may do anything as he is greater than all and there is no one to question him. Because of such an attitude he commits so many errors. Such ahaṁkārā whether it is due to wealth, learning or position, whatever may be the reason, it affects the mind and causes him to do innumerable number of wrong doings. However inspite of all this he feels, “nobody can question me or reprimand me, I can do whatever I want “. However the Śāstrā says to such a person, “Even if you are not facing the repercussions of whatever you did here, do you think you won’t face them even after you leave this body upon its death? For whatever adharma you have done in this lifetime you have to face the results of all of them. You cannot escape from anything whatsoever”. Therefore ahaṁkārā becomes an enemy to us. Furthermore there is jealousy (mātsaryam). When another person is doing good things, great things, one cannot accept it as it is. This is mātsarya. When another person has accomplished some great thing, the fellow with jealousy is not happy about it but rather says something like, “Well, I know where he got his funds from”. Deliberately the fellow points out some drawback or says ill about the other. What does one lose by saying a word of praise, “Yes, indeed he had done a good job”? Nothing at all. Still this fellow has nothing good to say but instead had some empty criticism only. This only demonstrates the fellow’s inability to stand another’s progress. Have I spent today like an animal or like a satpuruṣa? If one were to answer honestly, then the answer “I spent my time today like a man of wisdom, a satpuruṣa” would be very rare normally. Because one cannot lie to one’s own intellect. To anyone else one may tell lies. Even a thief who cheats the people and the law had to still face his own manasākṣī(the inner witness) which cannot be cheated. This inner witness will ensure that the thief feels “I am a cheat and a thief”. One cannot therefore lie to one’s own manasākṣī. So when the question comes as to how one spent one’s day, the typical honest answer is, “I did not spend my time wisely. I did this adharma, I cheated in this way, etc “. Like this everyone feels. This is our typical day. Only that day when one gets the answer, “Today I did not do any adharma. I have spent my time like a satpuruṣa”, that day alone is our day of glory. The more such glorious days increase in number, the more our minds have become free from defects and therefore purified. The import is – “do not become arrogant on account of your wealth, family, or youth; these are all only fleeting things. If you feel arrogant on account of your wealth think about how long it is going to last. If you feel proud about your education, are there not people far more educated than you? If you are bombastic about your position, remember that it is only a matter of time before you lose it; after losing your position nobody is going to respect you. Therefore it is not wise to become arrogant on account of any of these.” Bhagavatpādā has given us these messages hundreds of years ago. This if we purify our minds by removing these defects from our minds, then we will gain the qualification to understand Vedāntā. At that occasion, if our Guru teaches us the Vedāntā tattva by unfolding the Śāstrā , and if we then remain meditating upon that Vedāntā tattva continuously, then we gain Ātmajñāna upon which there will no longer be any more births for us. And when we become free from birth, Yama will no longer bother us. There is no other purifier that is comparable to jñāna. This jñāna is nothing other than Ātmajñāna, no other jñāna has such a status. Thus we must attempt to gain this Ātmajñāna. But even to attempt this, we need Bhagavān’s grace. Without the grace of Bhagavān none of our efforts will bear fruit. Only with Bhagavān’s anugraha is victory possible in any effort we may undertake. Thus we must therefore worship the Lord with bhakti. One must have unshakeable bhakti towards the Lord. Bhagavān is one only, there are not many of them. But one can do upāsanā towards Him in any form. There is no real difference between the various forms of the Lord. Today morning a journalist asked me,”Swāmi, who is your iṣṭa daivam (favourite lord)? “. I said, “Only if there are many Lords can we talk about a particular one as favourite. I see only one Lord. So how can I pick any favourite? That question does not even arise“. This is our siddhānta. Thus we must have peerless devotion towards the Lord and worship him. If we do that, then the defects in our mind will go away because of His grace. Thus our minds will become purified and we can do Ātmavichāra. Having done so we can gain ātmajñāna and thereby gain freedom from birth and hence victory over death. This is the way shown by Bhagavatpādā for leading a fulfilling and purposeful life. We should all go in this path as indicated by him. This is the message I wanted to give you all today. All of you have gathered here today with great śraddhā and bhakti towards the Sringeri Sharada Pīṭham. This had pleased me much. I convey my blessing to all here, and I pray that the Jagadambā, the universal Mother, Mathurāmnanāyakī, protect you and bestow upon you all that is good.